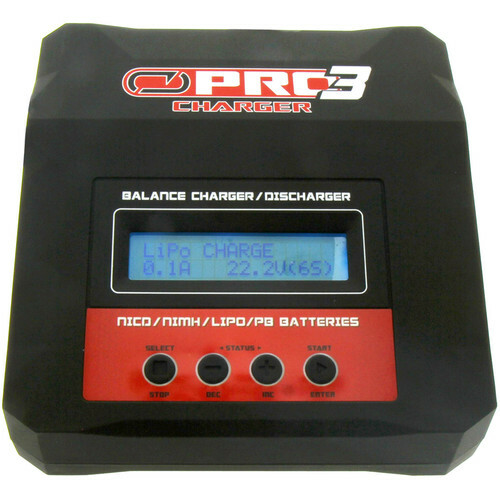 The Pro Charger 3 from Venom Group features an integrated power supply with an on-board balance block. It supports charging rates of up to 7A. Box Dimensions (LxWxH) 8.8 x 6.2 x 3.1"
Pro Charger 3 7 Amp Charger for LiPo and NiMH Model Batteries is rated 4.5 out of 5 by 2. Rated 4 out of 5 by Aerial Shooter from Works well, easy to use The charger works great, and deserves 5 stars. I gave it a 4 because it does not have a cell balance board lead extension, or any balance lead extensions of any size included. Using it without means charging cannot be done in a Lipo safe bag. The terminals on the side will accommodate 1 thru 6 cell balance lead plugs, there is a fist full of terminal leads for almost every possible batter connector, excluding the xt150/ax150. Rated 5 out of 5 by Khairuddin from Such a handsome all-in-one charger. Works like a pro and instructions are very clear.